In the late 80’s journalist and space enthusiast Al Reinart through extensive research into the NASA archives discovered a wealth of unused, unseen footage from the Apollo space missions – footage though intended only for science research which deserved to be seen by the global public. Using these images, the words of the original Apollo astronauts and the glorious music of Brian Eno, Reinart fashioned these images into a unique portrait of the moon. It’s a more a visual essay than a narrative recounting of the program. In fact, we don’t even know whose voices are talking, or who we’re seeing on screen, or what expedition footage we’re looking at. It’s all part of the immersive poetic understanding of the feeling the celestial body evokes to our senses. 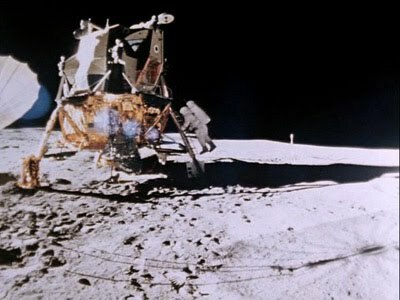 Only 12 men stood on the moon, and no one has been there since 1972. Looking on these images, and the fact that these astronauts got there with what seems like rudimentary technology back then, is remarkable. Brian Eno and Daniel Lanois’s music sets the perfect ambient tone which complements the spiritual sense of reflection which overcame most of the astronauts. In particular the track ‘Ascent’ was also used to great effect at the end of Steven Soderbergh’s “Traffic”. The music album took a life of its own in fact. It was actually released in 1983, 6 years before the movie, due to a long delay in its release. Since then a number of filmmakers have copped tracks from that album, entitled ‘Apollo: Atmospheres and Soundtracks”, in particular Danny Boyle in both “Trainspotting” and “28 Days Later”. While the Criterion Blu-Ray is the best viewing experience for your television set, the film needs to be seen in a theatre. This was Reinart’s motivation for producing the documentary – to let the viewing public see these images projected on a big screen and put the audience as close as possible into the spacesuits of the astronauts. And so, sadly we never quite get a sense of the grandeur of the moon and the quality of these phenomenal images. The film also had much of its thunder stolen by the even better moon doc “In the Shadow of the Moon” and to a certain extent the NASA IMAX films – which used moon footage and on camera interviews to tell much the same story, with less conceptual abstraction. But neither film can fully take away from the irony of Reinart’s vision – while to the NASAS scientists the journey to the moon was intended only for science and research, in ‘For All Mankind’, it becomes a uniquely poetic and artistic experience.